We had an unexpected death in the immediate family today. All my big plans for poetry month are now on hold, as I'll be stepping away for a while. Please keep my family, and especially my husband, in your prayers. So, to who, what, or where have you lost your heart? Leave me a note about your poem and I'll share the results later this week. 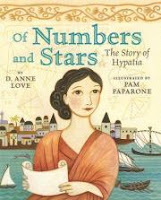 Today's Monday Math Freebie is up over at Bookish Ways in Math and Science. 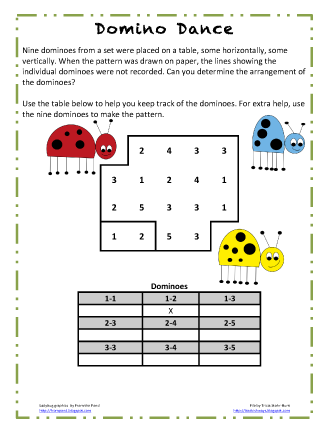 You'll find a problem solving activity where students must determine a pattern of dominoes placed on a table. The pattern is missing the lines showing the individual dominoes. 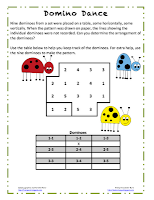 Students must use their reasoning skills to determine the arrangement of the dominoes. I've been playing the absent-minded professor lately. I seem to be forgetting everything. In thinking about my seemingly constant state of confusion, I was reminded of this poem by Lilian Moore. So, I'm thinking we need to write some forgetful poems this week. Will you join me? Leave me a note about your poem and I'll share the results later this week. 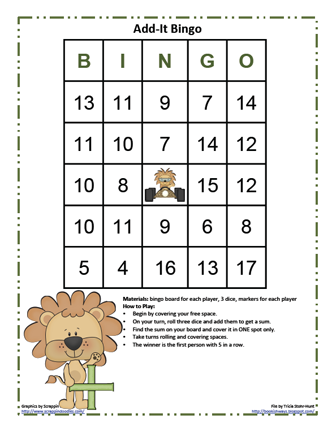 Today's Monday Math Freebie is up over at Bookish Ways in Math and Science. 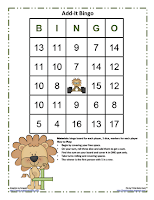 You'll find two versions of a bingo game that allows students to practice addition with multiple addends and the associative property. In part one of this series (over at Kidlit Celebrates Women’s History Month), I wrote about women in science who boldly went where no women had gone before. Today I want to continue this series by looking at 20th century women and their contributions to science. Born and raised in Pennsylvania, Rachel Carson developed an interest in and curiosity about nature at an early age. She took long walks with her mother where she learned the names of the local flora and fauna. 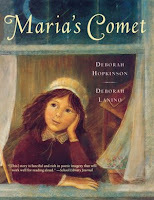 She became an author at the age of ten when her first work was published in a children's magazine. She studied biology in college and graduate school, eventually taking a position with the agency that would eventually become the U.S. Fish and Wildlife Service. Over the years she wrote books about the ocean, nature study, and more. Her best known work is SILENT SPRING, a book that was first published in three serialized excerpts in the New Yorker in June of 1962, and written to raise awareness of the pesticide DDT and the impact it was having on the environment. 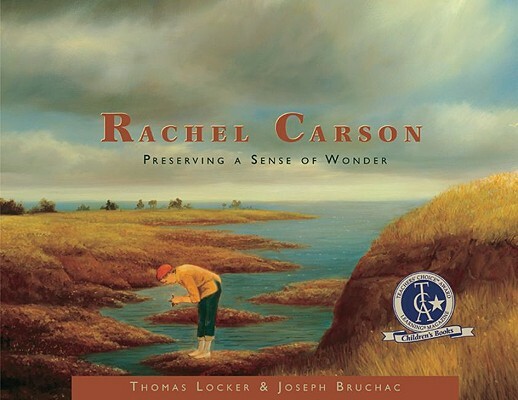 RACHEL CARSON: PRESERVING A SENSE OF WONDER, written by Joseph Bruchac and illustrated by Thomas Locker, is a poetic biography that briefly presents describes her childhood, education, career and accomplishments. The back matter contains excerpts from her writings and additional biographical information, including the titles of her most notable books. The U.S. Fish and Wildlife Service has an informational page devoted to Rachel Carson and her legacy. You can view a brief video introduction to Carson and her work. 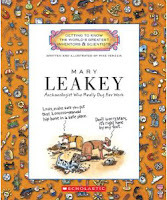 Mary Leakey is recognized by many as one of the world’s most distinguished archaeologists and fossil hunters. At the age of 17 she began auditing courses in archaeology and geology at university and was soon recognized for her knowledge of stone tools and skills in scientific illustration. She was invited join Louis Leakey on a trip to Africa to draw the stone tools he had found. Three years later they were married and her lifelong work had begun. MARY LEAKEY: ARCHAEOLOGIST WHO REALLY DUG HER WORK, written and illustrated by Mike Venezia, is a title in the quirky, humorous, informational series "Getting to Know the World's Greatest Inventors & Scientists." 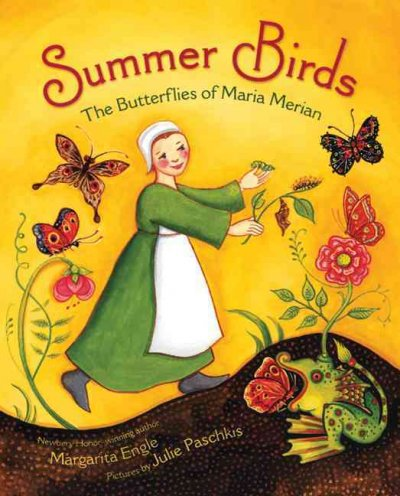 Combining photographs, cartoon illustrations, and easy-to-read text, Venezia tells the story of Mary's life, from birth to death with heavy emphasis on her work in Africa and her many important discoveries. The Leakey Family site has a nice biography of Mary, as well as a photo gallery, list of books published by the Leakey's and more. Mary Leakey: Unearthing History is a reprint of a profile of Dr. Leakey that originally appeared in the October 1994 issue of Scientific American. 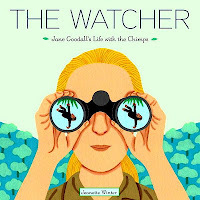 Jane Goodall was an observer, spending her childhood watching the animals in her world. She dreamed of traveling to Africa to study animals. When she finally realized her dream of traveling to Africa, she met Dr. Louis Leakey within weeks of arriving. He hired her as an assistant and eventually asked her to study of a group of wild chimpanzees in Tanzania, believing that knowledge about wild chimpanzees might help us to better understand our evolutionary past. Jane spent more than 25 years studying chimpanzees in what eventually became known as the Gombe Stream Research Center. Her book detailing this work, THE CHIMPANZEES OF GOMBE: PATTERNS OF BEHAVIOR, was published in 1986. 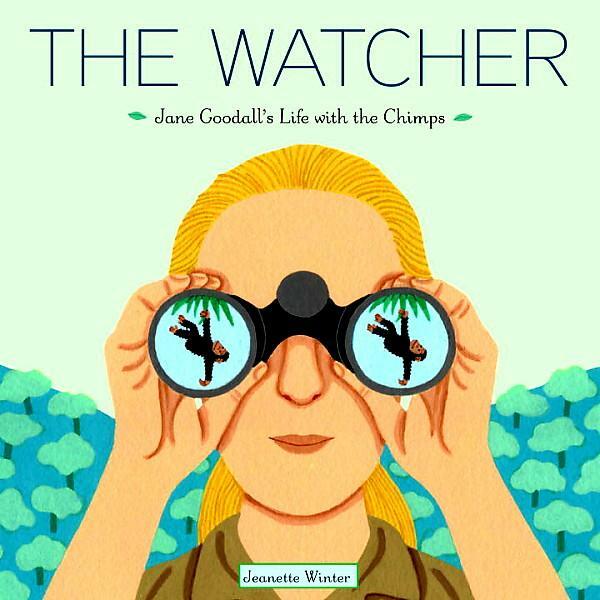 THE WATCHER: JANE GOODALL'S LIFE WITH THE CHIMPS, written and illustrated by Jeanette Winter, highlights Goodall's life as an avid observer and focuses largely on her accomplishments with the chimpanzees. With vibrant illustrations and economical text, Winter gives readers a moving biography. In her note about the story she writes, "I wish that when I was a little girl, I could have read about someone like Jane Goodall--a brave woman who wasn't afraid to do something that had never been done before. So now I've made this book for that little girl, who still speaks to me." 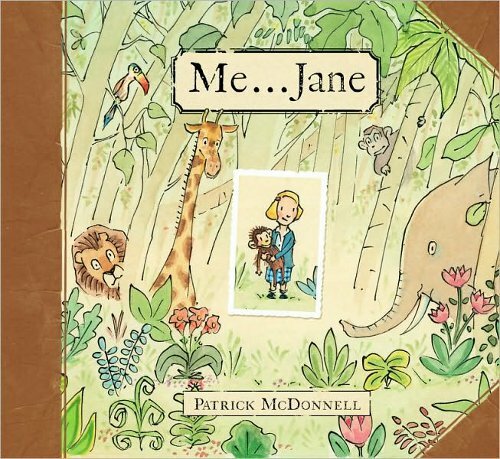 Another terrific title about Goodall is ME ... JANE, written and illustrated by Patrick McDonnell. This 2012 Caldecott honor book tells the story of Goodall's childhood, highlighting her love of nature, curiosity, and dreams of Africa. Ironically, Jane does it all with her beloved stuffed chimpanzee, Jubilee, by her side. McDonnell's art is composed of India ink and watercolor in earth tone shades. The pages include ornamental engravings from the 19th and early 20th centuries. These images evoke Jane's love of nature, and enrich the overall design with illustrations that include a ship, elephant, zebra, chimpanzee, eggs, a leaf, tree, moons, squirrels and more. McDonnell also includes pages of Jane's childhood journal, as well as an image she drew as an adult of her life in the forest at Gombe. Visit the Jane Goodall Institute to learn more about the woman and her work. Animal Planet has a nice piece on Celebrating 50 Years in Gombe. 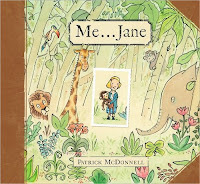 SLJ has a nice interview with Patrick McDonnell about ME ... JANE. Sylvia Earle is an oceanographer who has led more than 60 expeditions worldwide and spent more than 7000 hours underwater in connection with her research. In 1990 she was appointed as Chief Scientist of the National Oceanic and Atmospheric Administration, the first woman to hold such a position. Today Dr. Earle is Explorer in Residence at the National Geographic Society. Recently she led the Google Ocean Advisory Council where she provided content and scientific oversight for the ocean components in Google Earth. 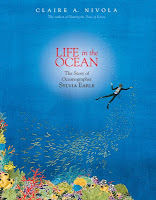 LIFE IN THE OCEAN: THE STORY OF OCEANOGRAPHER SYLVIA EARLE, written and illustrated by Claire A. Nivola, introduces readers to Sylvia's early life, her passion for the ocean, and her work in ocean exploration and advocacy. The gorgeous illustrations showcase the wonders of the sea. Nivola's use of quotes from Earle nicely convey the spirit of this underwater explorer. 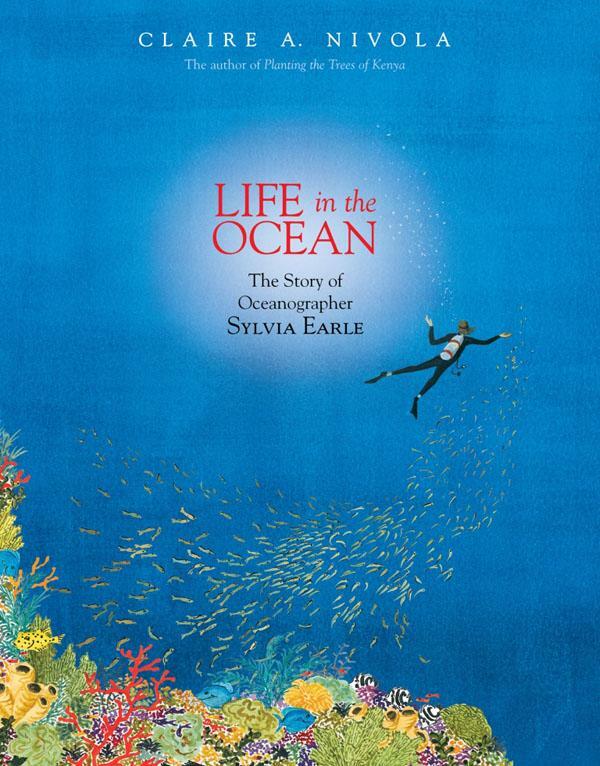 National Geographic Kids has an interview with Sylvia Earle. Spend a few minutes and listen to Dr. Earle talk about the oceans. Wangari Maathai was a scientist, environmentalist, founder of the Green Belt Movement, advocate for social justice, human rights, and democracy, and a Nobel Peace Laureate. At the urging of her brother she attended school at a time when most young women were not educated. She studied in the United States and returned to Kenya in 1966. In 1971 she became the first woman in East and Central Africa to earn a Ph.D. In 1976 she introduced the idea of community-based tree planting and eventually founded the Green Belt Movement (GBM), an organization focused on poverty reduction and environmental conservation. To date the GBM has assisted women in planting more than 40 million trees on community lands including farms, schools and church compounds. MAMA MITI: WANGARI MAATHAI AND THE TREES OF KENYA, written by Donna Jo Napoli and illustrated by Kadir Nelson, is a beautifully written and gorgeously illustrated work. When a succession of village women come to Maathai for advice about how to survive with dirty water, sick cows, too little food, and other problems, the answer was always the same--"Go home and plant trees." Maathai suggested a different species to solve each of these problems. After advising each woman on a type of tree to plant, she bids them, "Thayu nyumba," or "Peace, my people." 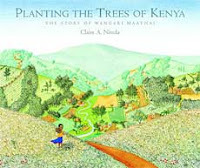 The back matter includes a Kikuyu glossary, a short biography of Maathai, additional resources, and a note from the illustrator describing the artwork. 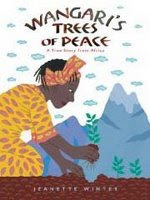 WANGARI'S TREES OF PEACE: A TRUE STORY FROM AFRICA, written and illustrated by Jeanette Winter, is a biography of Mathaai told in clear, simple text and accompanied by vibrant acrylic illustrations. Readers see the landscape of Kenya change from barren to beautiful as a result of efforts by Wangari and the women who embraced her Green Belt Movement. It is a story full of hope and beauty. The author's note in the back provides more information about Wangari and the Green Belt Movement she started in 1977. Just a few days ago Donna Jo Napoli wrote a post for the Kidlit Celebrates Women’s History Month blog entitled Writing About Wangari Maathai. You can learn more about the Green Belt Movement. Once again, I'm amazed at the power of women with brains, heart, determination, and passion. I hope these brief introductions motivate you to learn more about them and look for their inspiring stories. Women in Science is Up! Head on over to KidLit Celebrates Women’s History Month and check out my guest post entitled Women in Science: Trailblazers Before the 20th Century. Here are a few of the books you'll read about. Do you know these women? KidLit Celebrates Women’s History Month is a blog that was founded in 2011 to commemorate Women's History Month across the kidlitosphere. You can read about the blog's founding and last year's efforts in the SLJ article Kidlit Bloggers Celebrate Women's History Month. On March 8th you will find me there, writing about science. The post focuses on women in science prior to the 20th century and a few children's books that highlight their lives and work. I hope you'll stop by KidLit Celebrates Women’s History Month every day this month and check out the wonderful tributes to women. For a while now I have been encouraging my students and the teachers I work with to consider games for homework. 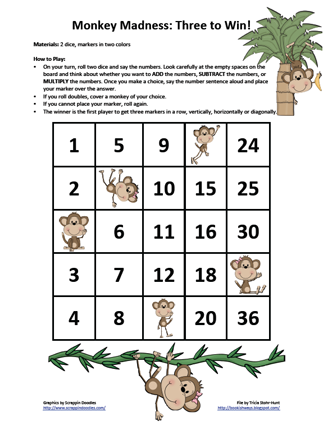 Can you imagine what your view of math might be today if your teacher sent you home with a game instead of a worksheet with 50 problems? I'm a game player at heart and know that my problem solving skills and facility with numbers developed in part because I played board games of all kinds. With so many kids spending time on the computers, smart phones, Wii's and other electronic devices, I'm convinced they miss out on a great deal when they don't sit down with another human being and engage in simple conversation and a battle of wits over a game. Over at my other blog, Bookish Ways in Math and Science, I've started a new feature called Monday Math Freebies. If you are a teacher, know a teacher, or just like to play games with your kids, then this is for you. 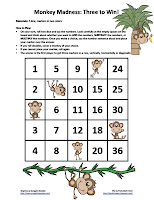 Each week I'll be sharing a few math resources to help kids practice basic skills and other important math concepts. The games require few resources beyond a game board (which I provide), dice or playing cards, and some kind of marker. The game files are free and come with directions. I hope you'll try them out and let me know what you think. Head on over and check out today's freebies, Fishing for Numbers and Monkey Madness: Three to Win!. Last week I was feeling Fibonacci. Since I'm still in a mathematical mood, this week I'm feeling Zeno. The Zeno is a poetic form that was invented by our esteemed Children's Poet Laureate, J. Patrick Lewis. Here's Pat's explanation of the form. So, that's the challenge for the week. What kind of Zeno will you write? Leave me a note about your poem and I'll post the results here later this week.